The Centre is not budging despite the fact that nearly 12,000 farmers are committing suicide every year, the Congress leader claimed. 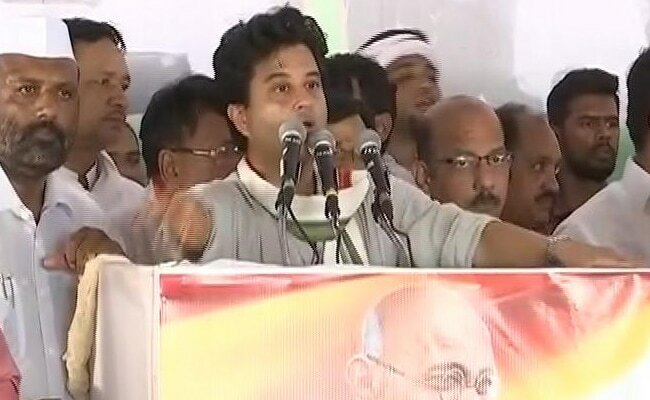 Bhopal: Congress leader Jyotiraditya Scindia today said if BJP-ruled Uttar Pradesh and Maharashtra can announce farm loan waivers why the same party which ruled Madhya Pradesh cannot do this. Mr Scindia, sitting on a 72-hour 'satyagraha' since yesterday in support of farmers, also criticised the state's BJP government for not taking any action against those who fired at the farmers in Mandsaur last week, killing five of them. Following protests by cultivators in Maharashtra, the Devendra Fadnavis-led government on Sunday announced a loan-waiver for farmers and decided to form a committee to work out the debt-relief criteria. "When the BJP governments in Uttar Pradesh and Maharashtra have announced to waive farm loans, why the same party's regime in Madhya Pradesh has been shying away from announcing the same," Mr Scindia told reporters during his ongoing 'satyagraha' at TT Nagar's Dussehra Maidan in Bhopal. He said Prime Minister Narendra Modi himself had made several promises to make farming a beneficial venture with slogans like 'Abki Bar Kisano Ki Sarkar'. "The Prime Minister made a series of promises to make farming a profitable venture during election campaign. Now, the Centre is saying the state governments will have to arrange funds for loan waiver on their own and that the Centre government would not extend any help," he said. "Ten days after the farmer killings in Mandsaur, the state government has not taken any action against the guilty. The government has failed to inform who ordered the firing on farmers. They can't say anything because the farmers were killed on the orders of the state government," Mr Scindia said. He said Chief Minister Shivraj Singh Chouhan is now trying to "mollify" the families of the farmers killed by giving them a compensation of Rs 1 crore, jobs to the kin, among others.